The prime minister has said he wants to "stamp out" what he called "spurious" legal claims against British troops returning from war. David Cameron said ministers had been asked to draw up plans to curb claims, including by restricting "no win, no fee" arrangements. 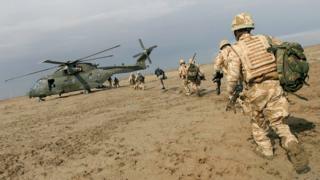 About 280 UK veterans are currently being investigated by the Iraq Historic Allegations Team over alleged abuse. IHAT, as it is known, was set up to investigate allegations of murder, abuse and torture of Iraqi civilians by UK military personnel between 2003 and 2009. It has considered at least 1,514 possible victims - of whom 280 are alleged to have been unlawfully killed - and completed fewer than 60 investigations. Lawyers are continuing to refer cases. Defence Secretary Michael Fallon has criticised what he called "ambulance-chasing British law firms" and argued there is "a strong case" for suspending the European human rights law when sending forces into action overseas. In a statement issued on Friday, Mr Cameron said there was now "an industry trying to profit from spurious claims" against UK military personnel. "Our armed forces are rightly held to the highest standards - but I want our troops to know that when they get home from action overseas this government will protect them from being hounded by lawyers over claims that are totally without foundation." The National Security Council - a cabinet committee set up by David Cameron which meets weekly to discuss security and defence strategy - has been ordered to produce "a comprehensive plan to stamp out this industry", he said. A spokesman for law firm Leigh Day said Mr Cameron should not challenge the principle that "no-one is above the law, not us, not the British army and not the government". Many cases of abuse had come to light and been accepted by the government, with payouts for over 300 cases relating to abuse and unlawful detention of Iraqis, he said. He added: "The vast majority of serving army soldiers do a first-class job in protecting this country but the evidence shows that this is by no means the case for all." Lord Dannatt, former chief of the general staff, said Mr Cameron was right "to draw a line in the sand" and protect the military's "freedom" to operate. Lawyers "absolutely enjoy" contested cases, because it meant their fees became "excruciatingly high", he said. "That is the sort of thing the prime minister is trying to bear down on. No-one is saying the military is above the law." But Nicholas Mercer, the Army's chief legal adviser in Iraq after the 2003 invasion, said it was wrong "simply to polarise it as money-grabbing lawyers". "There are plenty of us who have raised our concerns without any financial motive at all, if indeed the other lawyers have got a financial motive," he told BBC Radio 4's Today programme. "The government have paid out £20m for 326 cases to date. Anyone who has fought the MoD knows that they don't pay out for nothing." The Legal Aid Agency - the Ministry of Justice department which provides legal aid and advice in England and Wales - has also been asked to consider whether legal aid arrangements should be temporarily restricted for any firm being investigated for misconduct. Leigh Day has been referred to the Solicitors Disciplinary Tribunal over allegations it failed to disclose a key document during the £31m Al-Sweady inquiry, which found that allegations that UK troops had murdered and mutilated Iraqi detainees were "deliberate lies". The firm has strongly denied allegations of wrongdoing and said it would "vigorously" defend itself. In 2011, another inquiry into claims of abuse highlighted the death of hotel worker Baha Mousa with 93 injuries in British military custody, and blamed "corporate failure" at the Ministry of Defence for the use of banned interrogation methods in Iraq.